Large decorations from KunstLoft are something that no one will fail to catch sight of and fall in love with immediately. These eye-catching sculptures have a stunning effect when place in your spacious office or hotel foyer. 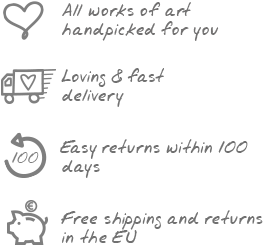 Thanks to their lovely details, our handmade artworks stand out easily from cheap, mass-produced items, since we value every piece of our exquisite artworks that should reflect your personality. While you can stimulate your imagination with abstract sculptures, you can make a concrete statement with figurative sculptures. With a chilli sculpture, you can show off your fiery taste; or alternatively let everyone know your love for the animal world with our exclusive animals sculptures. If you have little available space, then a small-sized handmade canvas painting or sculpture is certainly the right choice. On the other hand, when you have more space, then you can also afford to be more daring and opt for a handmade artwork that astonishes with its mere size. XXL oil paintings or large decorations will fill your doctor’s office or living room with enthusiasm and hold your guests’ attention. In particular, a large format metal wall decor strikes the eye effortlessly, since it is distinguished not only by size but also by its extraordinary material. The metallic colours are iridescent by nature and they shimmer in a slightly different shade under different lights. It is a magical play of colours! We want you to find the perfect artwork, hence we at KunstLoft will never be tired of scouting around for new motifs or styles in vogue and various lively colours. Furthermore, we take care to offer our acrylic paintings and sculptures in different sizes. Large decorations combine well with small to medium-sized decorations and canvas paintings are equally available in every size or format. Handmade paintings of lifestyle and fashion make a great decoration for your dining room. A handcrafted strawberry sculpture will tempt you to have a bite of it. A fascinating show of colours is presented on extravagantly large painting. Canvas paintings in Shabby Chic style will bring a romantic atmosphere to your sleeping room. Browse through our KunstLoft and open your eyes to artworks that our artists create using high quality materials. You can obtain all of our paintings and sculptures at an affordable price, and we even offer you special discounts in our sale section. At KunstLoft you will find not only small-format sculptures, but also large decorations that will inspire you with their extravagant format. The loving details can unfold their full effect in the striking size. With large sculptures or wall decoration you confidently stand for modern art.